Canopy Connect improves the coordination, tracking, and funding of interpreter services at healthcare organizations, to elevate the quality of care for the Limited-English proficient (LEP) patients. In the pilot, the platform will be rolled out to 12-15 providers in departments with a need for “on-the-fly” translation services and then scaled to 45-60 providers and allow for the tracking and coordination of translation services. CareGeneral offers a care coordination platform and web/mobile app that provides personalized care plans for patient adherence and education in up to 5 languages. In this pilot, CareGeneral and Northwell-Lenox Hill will target the Hispanic population (with a focus on diabetes management) to track patient engagement/adherence, utilization of hospital services and improved clinical outcomes/self-care behavior. Klara is a cloud-based secure messaging tool for healthcare professionals used to assist with workflow, care coordination and patient-centered care. The pilot with Betances focuses on provider communication with their patients over messaging. The goal is to to reduce the time per patient request (which would typically be handled over the phone) and avoid unnecessary call-backs and voicemails. PurpleSun offers a patented device that illuminates targeted spaces with UV light, to disinfect hospital/healthcare equipment in 90 seconds. With both a hardware device and mobile app, the pilot's goal is to evaluate the implementation of the PurpleSun System between surgery cases, evaluate the quality of disinfection and assess the process/impact on operational turnover time between surgery cases at 2 hospital sites. Vital Score offers a point of care platform that activates patients to be more engaged in their health via chatbots, surveys and text messaging digital conversations. The pilot aims to increase rates of participation in ACPNY services with a focus on increasing the HPV vaccination rate. Wellth is a mobile based platform that helps patients change their behaviors so they get better faster. By applying behavioral economics through scalable technology, the Wellth platform helps achieve better adherence, engagement, and health. In the pilot, the Wellth solution will be implemented with Acute Myocardial Infarction (AMI) and heart failure patients to increase medication adherence, decrease readamissions and reduce costs per patient. AgeWell is a peer-to-peer care model designed to improve well-being and promote health outcomes. In their pilot, they will test on 30 of Henry Street Settlement’s clients in order to reduce hospitalizations and emergency room visits. Bluestream Health brings remote expertise into the context of care delivery, while the Jewish Home’s 106th St. Skilled Nursing Facility plans to further this by conducting a pilot to prevent avoidable readmissions and ER visits in hospitals. Blue Mesa Health has developed a platform to help pre-diabetic patients lose weight. Through technology and health coaching, Blue Mesa will distribute connected scales and activity trackers in their pilot to 200 Mt. Sinai employees to reduce their risk of developing type II diabetes. InGen (Innervation + Genioglossus) and the Weill Cornell Medical College’s Center for Sleep Medicine plan to conduct a pilot study targeting the use of genioglossal strengthening on obstructive sleep apnea to give patients comfortable alternative and existing treatments. Quality Reviews is piloting RateMyHospital®, is a HIPAA-secure, patient relationship management platform with Mt. Sinai and will track patient satisfaction as the host implements service improvements at 2 facilities. 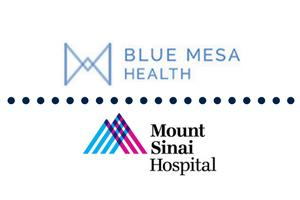 Using RecoverLink’s advanced algorithms, this pilot will cost-effectively allow Mount Sinai hospital to “virtually observe” heart failure patients at their homes in order to identify negative health behaviors, provide early intervention when necessary and course-correct risky behaviors. RubiconMD is a web-­based platform that allows primary care providers to send patient cases to specialists for quick e-­consults. In the pilot, Callen-Lorde providers will have access to RubiconMD to submit unlimited consults to top specialists to quantify the impact on improved clinical outcomes and avoid unnecessary costs and wait times. Yosi is a cloud-based mobile patient check-in and communication platform that helps patients manage their care across various providers, improving patient experience, access to preventive healthcare and provider workflow efficiencies. Smart Vision Labs teamed up with the SUNY College of Optometry in New York City to allow anyone in the world to test their vision and get a prescription by using the camera feature in their smartphone. This new vision test will compare against standard tests requiring machinery costing $10,000 and aims to revolutionize the way people get their eyeglasses worldwide. QoL Devices and the Children’s Hospital at Montefiore will pilot Alv.io, an advanced, mobile-connected respiratory training and monitoring device that uses interactive, animated games to incentivize engagement, personalize training, conduct performance analysis and monitor testing in children to improve asthma management. Referwell, formerly known as Urgent Consult, will work with Mt. Sinai Health System’s Cardiovascular Institute (CVI) to allow local physicians and admin staff to search for a nearby CVI physician who accepts the patient’s insurance, schedule an appointment, share medical info independent of EMRs, and register the patient, collecting demographic and insurance info. It will test the platform’s ability to help local primary care physicians effectively link their patients to life-saving specialty care. Fit4D and Healthfirst, which provide free and low-cost health insurance, are partnering to keep diabetes sufferers in the Bronx healthy and out of the hospital. In this pilot, Fit4D’s certified diabetes educators will use powerful algorithms to match Healthfirst members with the best diabetes treatments for each individual to reduce signs of complications and drive down costs. ACCGNY will implement a medication adherence program powered by AllazoEngine’s predictive analytics, and will focus on ACCGNY’s 6,353 attributed beneficiaries, 63% of whom are intellectually or developmentally disabled (IDD) and experience low medication adherence rates and high costs. The pilot will evaluate the accuracy of the predictions, the impact of interventions and the savings associated with adherence. Canopy Apps and VNSNY will seek to improve communications with non-English speaking patients using the Canopy Medical Translator app, which pre-translates medical phrases in 15 languages to communicate with patients during home visits. The pilot will seek to measure patient and provider satisfaction with patient-provider communication, as well as increased efficiency in the VNSNY workflow. VillageCare’s Health Home case managers will utilize the Healthify platform to connect patients through their mobile devices with the services they need to address the “social determinants of health,” like food insecurity, unsafe housing, domestic abuse and other issues. Through Healthify's database that will rate and review different community and government resources, VillageCare can direct their patients to the best possible help. Tactonic Technologies is partnering with NYU to test whether its system of imaging sensors and powerful software can help doctors at the NYU Rusk Center for Rehabilitation make an objective measure on whether a patient can walk steadily before discharging them. AdhereTech, who has created the wireless smart pill bottles that improve medication adherence will be working with Dr. Gulick, Professor of Medicine at Weill Cornell and the Principal Investigator of the Cornell HIV Clinical Trials Unit. In this joint pilot, they will assess patient adherence to an HIV drug regimen (tenofovir-based) over 12 weeks using AdhereTech bottles with reminders and feedback, compared to the usual standard of care. BioDigital is introducing its Human Platform, an interactive 3D virtual body into the Memorial Sloan-Kettering clinical workflow as a tool to more effectively communicate complex health topics. The expected results include increased patient engagement, understanding and satisfaction - all while saving doctors time. This pilot will test the outcomes of the eCaring web-based care management & monitoring system with a high need population of chronically ill, multicultural older adults in Henry Street Settlement’s Vladeck Cares Naturally Occurring Retirement Community (NORC). Patients & their caregivers will be randomly selected to receive eCaring for 6 months, while Pace RN’s will track data & assess the effect on the use of this platform. Opticology has developed a better way to measure blood glucose in the 17 million Type II diabetics: through ocular tears to help diabetics feel more comfortable when taking their measurement. The pilot will utilize a pen shaped device with glucose sensing chemistry at the tip that will gently touch the tears just above the lower eyelid and will measure the correlation between tear and blood glucose in diabetic patients. Sense Health is working with University Behavioral Associates (affiliated with Montefiore) to pilot their mobile patient support technology with case managers and patients in the Managed Addiction Treatment Services Program. If successful, this pilot will validate a technology that efficiently helps case managers deliver high intensity support to growing patient case loads. StarlingHealth and VillageCare are partnering to pilot the use of a nurse call and bedside communication system for patients through multi-lingual touchscreen tablets to improve patient care and satisfaction while reducing cost of care delivery at VillageCare Center for Rehabilitation and Nursing, a 105-bed sub-acute facility. Vital Care Services and Pace University will pilot the effectiveness of TeleHealth solutions to meet current and projected needs of diverse socio-economic communities in New York City. The purpose of this pilot is to reduce healthcare costs, increase access and quality of care, and train future working professionals at the University level.